How long have you been in the hotel industry? Almost seven years. Before joining the hotel industry, I was working in an industrial electronics company. Unfortunately, I was retrenched, but I told myself that I needed to adapt and look for other jobs. At that time, Resorts World Sentosa (RWS) was newly opened, so I thought that it was a good opportunity for me to try something new, and meet people from all over the world at the same time. How do you feel about working in the hotel industry? What I do now is very different from what I used to do before. I used to work with heavy machinery, but now I work with people. It’s a good change and a good opportunity to challenge myself, to learn and to grow. Can you tell us more about your role and what you do on a daily basis? I was promoted to the role of Senior Traffic Marshall in 2016. I’m mainly in charge of managing traffic in the coach bay area, but from time to time, I attend to traffic incidents in other parts of the integrated resort as well. I drive a buggy around the RWS premises, and I look out for guests who may require assistance. For example, they might have problems with their cars, or are lost and need directions. Sometimes, I’ll even ferry guests to their destination on my buggy if I can. Apart from that, I also plan work schedules and duty rosters for my team members. What do you enjoy about what you do? 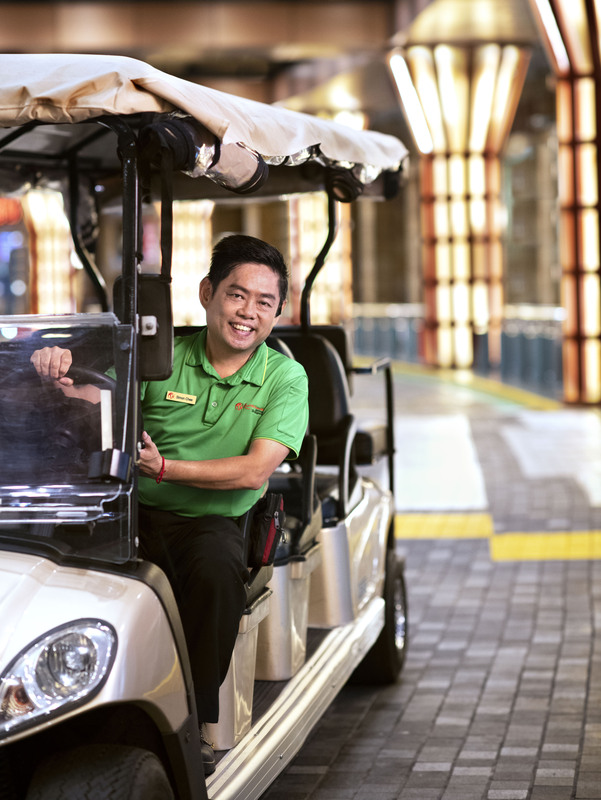 I enjoy ferrying guests around the resort on my buggy, and bringing them to their destination when they can’t find their way around the resort or late for an important appointment. It’s my way of providing a service and helping the guests, especially children and the elderly. Do you face any challenges at work, and how do you overcome them? Because our guests come from all over the world, sometimes we may not speak the same language. There was once I had to offer assistance to a Japanese guest who needed directions. The problem was that she couldn’t speak any English, and I don’t speak any Japanese. At first, I thought she needed help locating a bus or a taxi, but that wasn’t the case. So I decided to try using simple signs and gestures, and I found out that she needed to get to the cable car station. That’s just one challenge that I face at work sometimes, but I still do my best to help my guests as much as I can. Sometimes, I also encounter guests who can be demanding or very pressed for time. But I always try to be patient and understanding, so that I can turn any negative situation into a positive experience. How do you think you contribute to a guest’s happiness during his/her stay? I always make an effort to go the extra mile for my guests. One example would be the time I helped a guest who had trouble exiting the carpark late at night. After speaking to her, I found out that her parking ticket had expired, so I drove her on the buggy to get a new one. During the ride, she told me that she had planned to go to a convenience store to buy some supper. So I ferried her to a store nearby, but unfortunately, it was closed. Instead of stopping there, I recommended her some other food outlets and took her there as well. When we got back to the hotel, she wanted to thank me by giving me some vouchers, but I couldn’t accept them. I was just glad that I was able to help her. Instead, she wrote a complimentary letter to the hotel to thank me for my help. How does it feel to see a guest smile, or to receive a compliment? I feel motivated to do more and work harder. I don’t really need them to give me compliments or gifts. A simple smile, or a pat on the shoulder is more than enough to brighten my day and give me a boost at work. What motivates you to do your best every day? My colleagues and team members. There’s a ‘kampong spirit’ among my colleagues – we all help and support each other. The bond that we have drives us to do our best collectively every day. Do you have any goals that you hope to achieve during your time in the hotel industry? I want to take on more courses to improve myself, and to learn more about the hotel industry. I’m interested to find out about housekeeping. I’ve always found it interesting how they’re able to clean up the rooms so quickly, to ensure that guests can check in on time. What advice would you share with someone who is interested in joining the hotel industry? The hotel industry is all about people. So always make the effort to interact with the guests whenever you can, and always do your job with a smile.